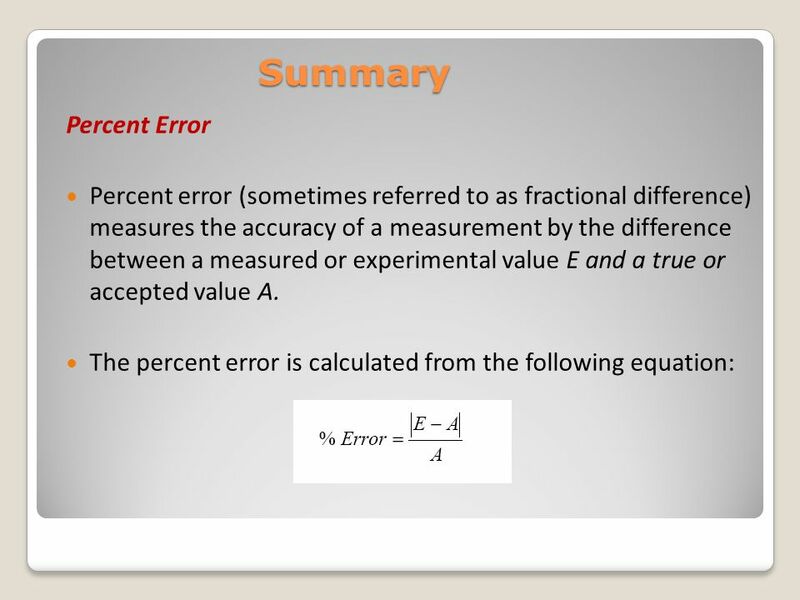 2 In conducting an experiment a person encounters one or more of three general types of errors: human error, systematic error, and random error. Human error (a mistake) occurs when you, the experimenter, make a mistake. Examples would be when you set up your experiment incorrectly, when you misread an instrument, or when you make a mistake in a calculation. 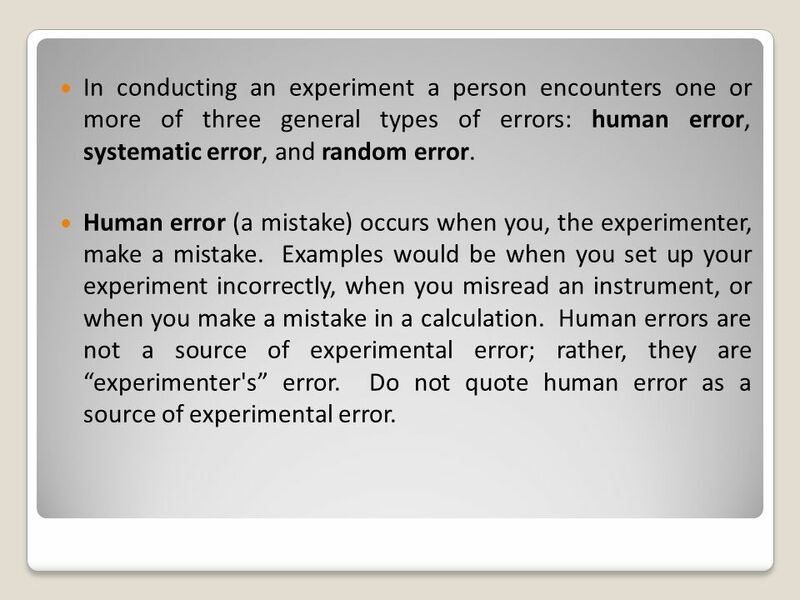 Human errors are not a source of experimental error; rather, they are “experimenter's” error. Do not quote human error as a source of experimental error. Every experimental result is subject to error. One can attempt to minimize errors but cannot eliminate them completely. 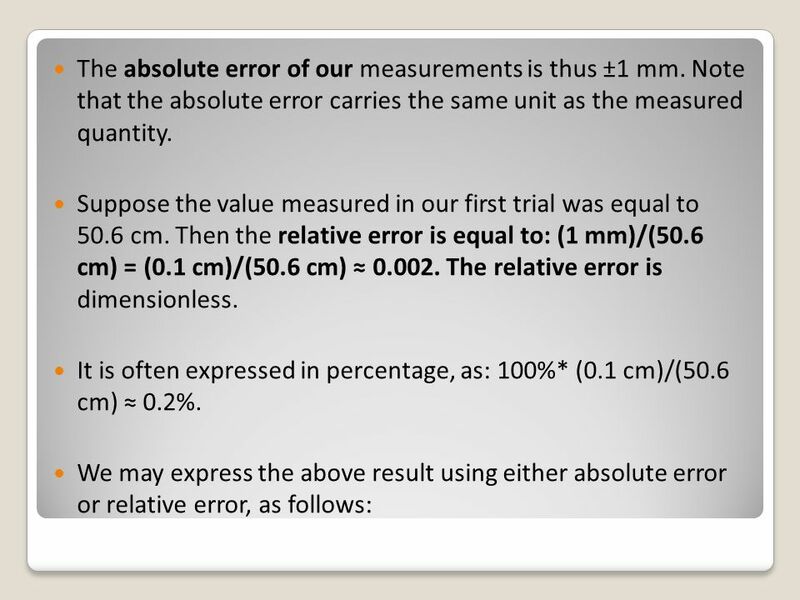 Random errors arise from natural limitations of making physical measurements. For example, repeated measurements of the same property often differ even if they are performed on a single instrument that is calibrated and operated properly. Such variations establish the precision of the measurement. The precision is also referred to as the reproducibility. 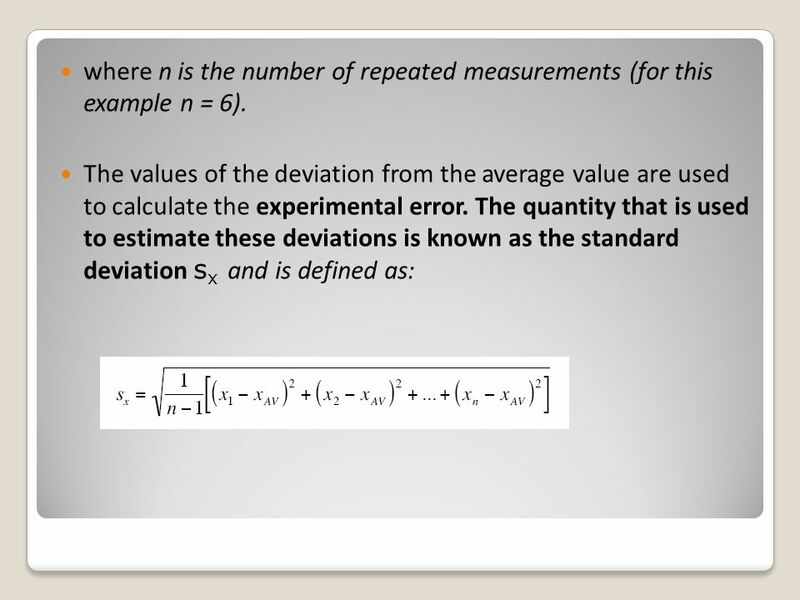 4 Random error can be reduced by averaging several measurements. All experiments have random error, which occurs because no measurement can be made with infinite precision. 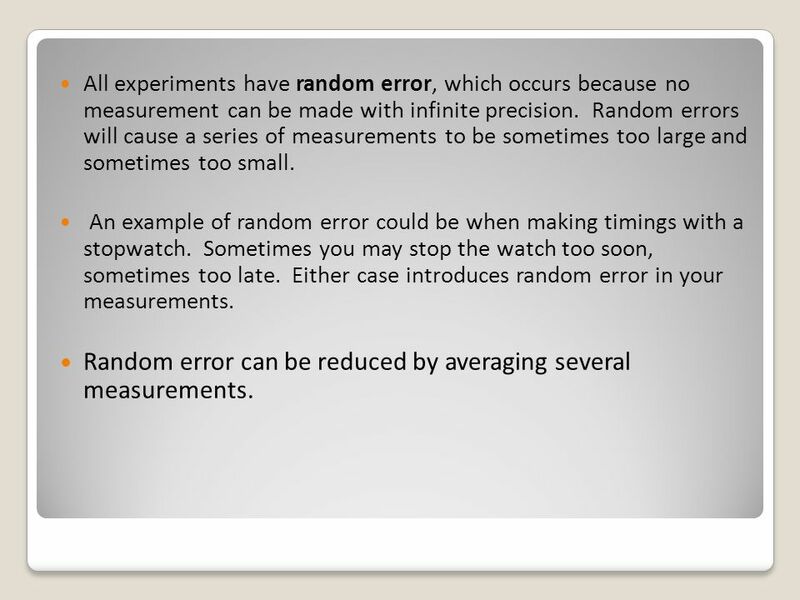 Random errors will cause a series of measurements to be sometimes too large and sometimes too small. An example of random error could be when making timings with a stopwatch. Sometimes you may stop the watch too soon, sometimes too late. Either case introduces random error in your measurements. 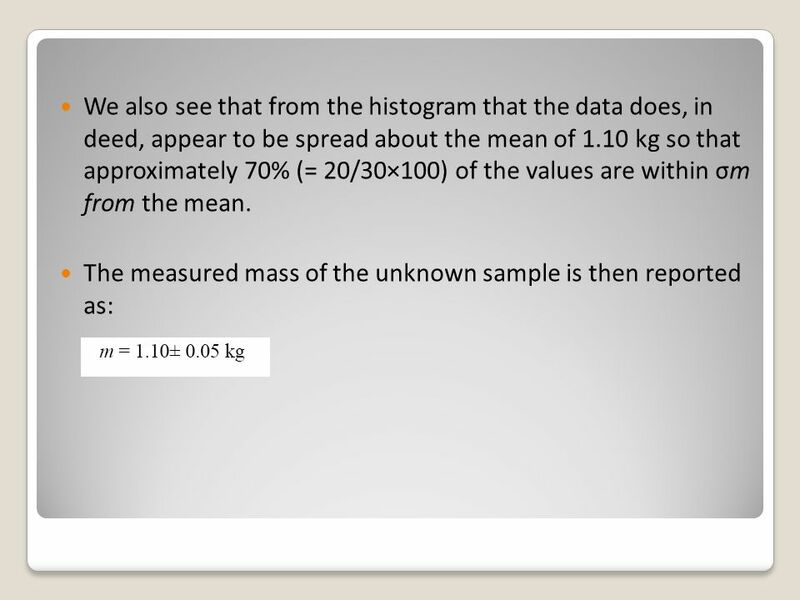 Random error can be reduced by averaging several measurements. 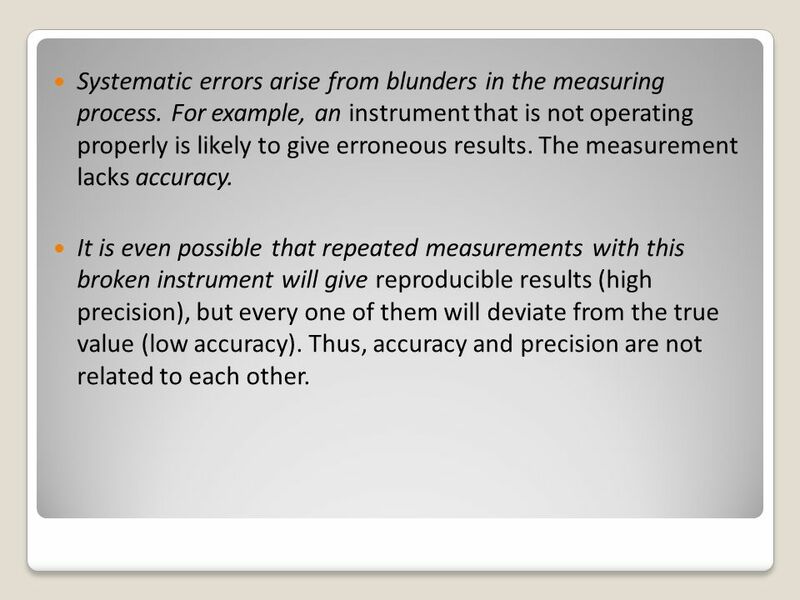 Systematic errors arise from blunders in the measuring process. For example, an instrument that is not operating properly is likely to give erroneous results. The measurement lacks accuracy. It is even possible that repeated measurements with this broken instrument will give reproducible results (high precision), but every one of them will deviate from the true value (low accuracy). Thus, accuracy and precision are not related to each other. 6 Systematic error is an error inherent in the experimental set up which causes the results to be skewed in the same direction every time, i.e., always too large or always too small. 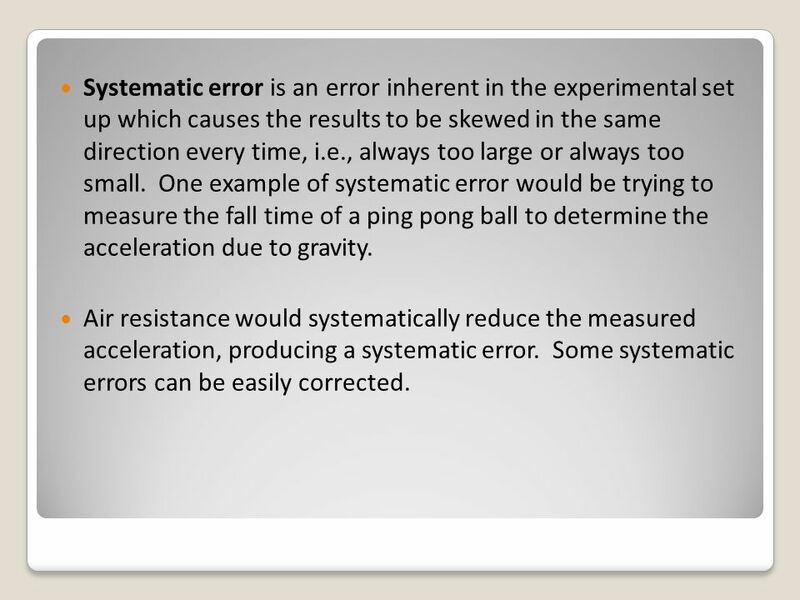 One example of systematic error would be trying to measure the fall time of a ping pong ball to determine the acceleration due to gravity. Air resistance would systematically reduce the measured acceleration, producing a systematic error. Some systematic errors can be easily corrected. 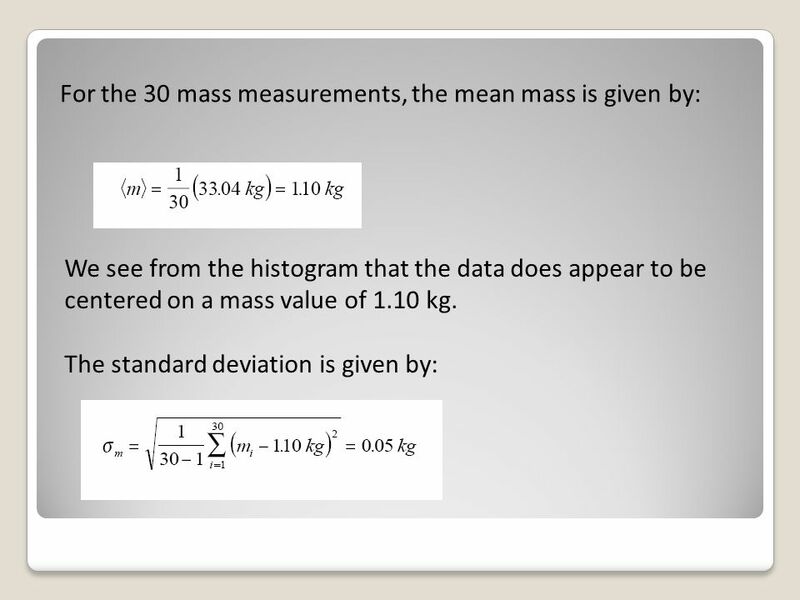 For example, if a balance reads 0.25 g when there is no mass on it, this would introduce a systematic error to each mass measurement—they would all be too large by 0.25 g. This can be corrected by zeroing the balance. 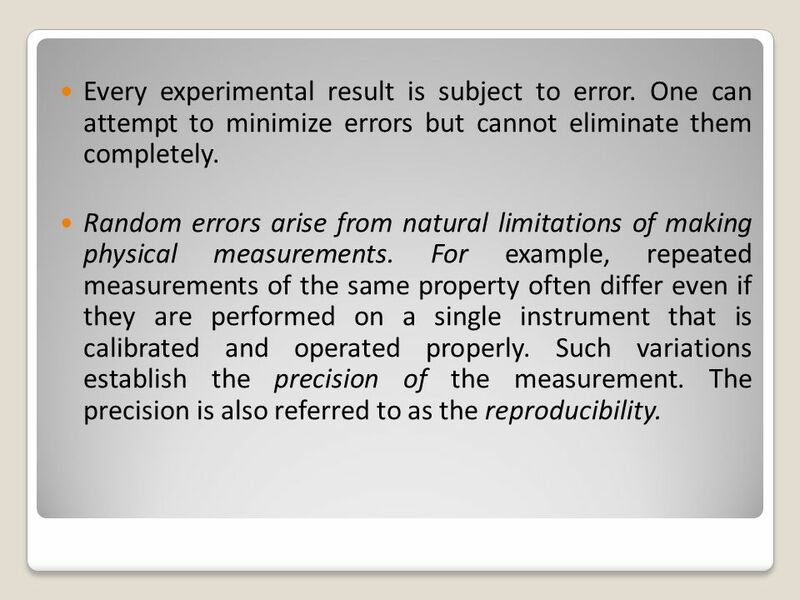 Other systematic errors can only be eliminated by using a different experimental setup. Most of the simple experiments you do will have some systematic error. In order to learn the meaning of certain terms, consider an experiment in which we use the ultrasonic motion sensor to measure the position x of an object. The accuracy of the motion sensor has been specified by the manufacturer as ±1 mm. 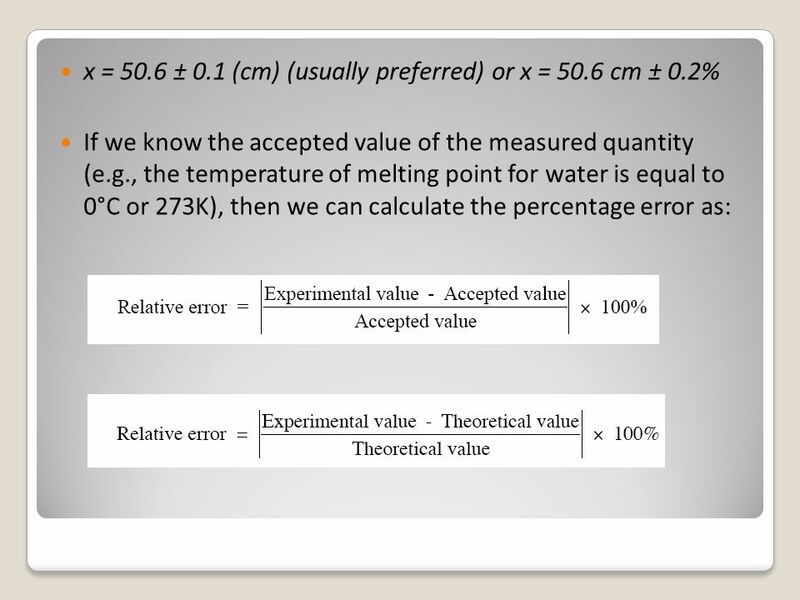 10 If we do not know the accepted value of the measured quantity, but the measurements have been repeated several times for the same conditions, one can use the spread of the results themselves to estimate the experimental error. 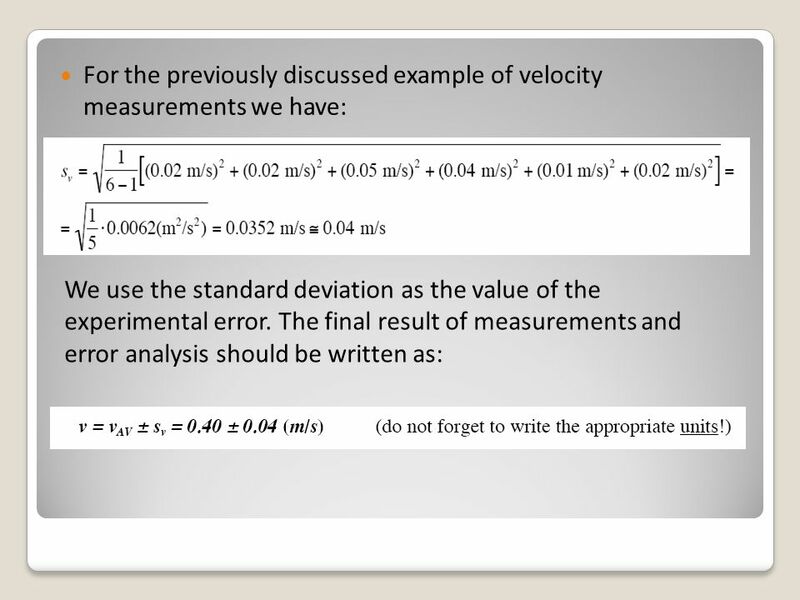 Consider the following results of velocity measurements: 0.38, 0.38, 0.35, 0.44, 0.43, 0.42 m/s. 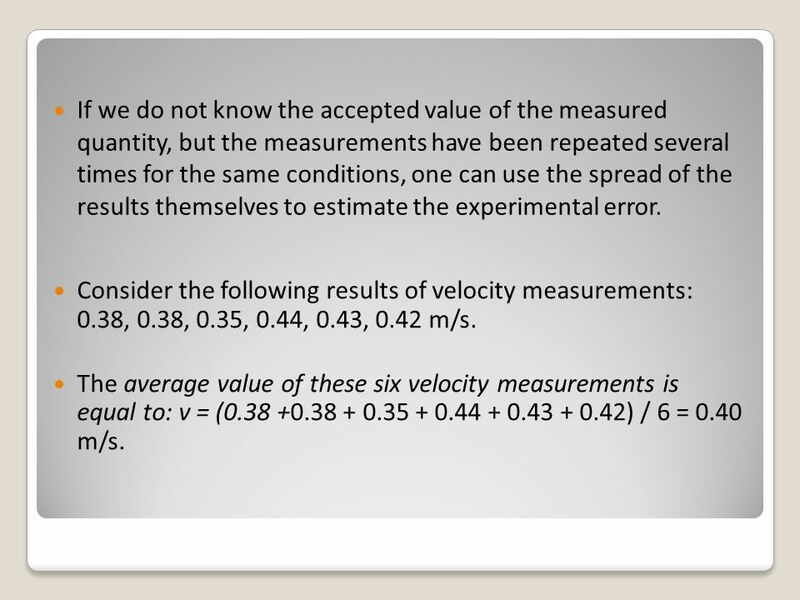 The average value of these six velocity measurements is equal to: v = ( ) / 6 = m/s. 12 where n is the number of repeated measurements (for this example n = 6). 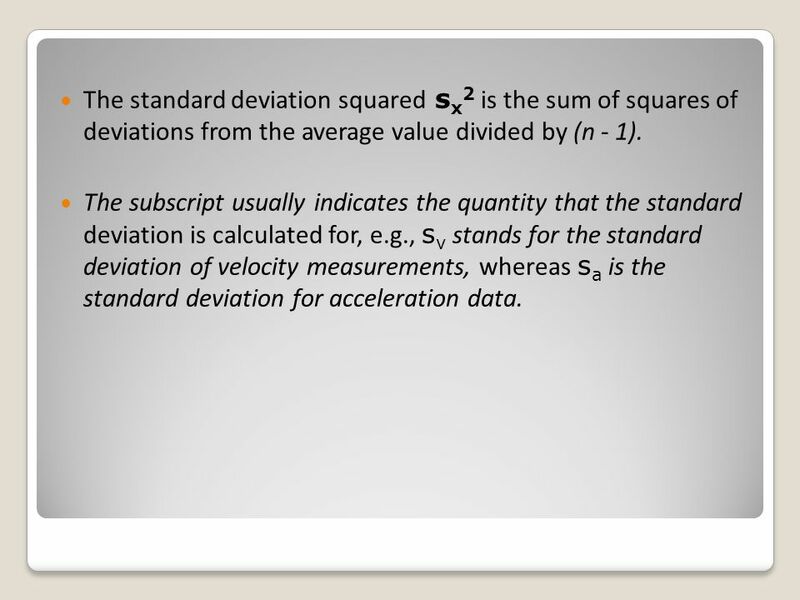 13 The standard deviation squared sx2 is the sum of squares of deviations from the average value divided by (n - 1). 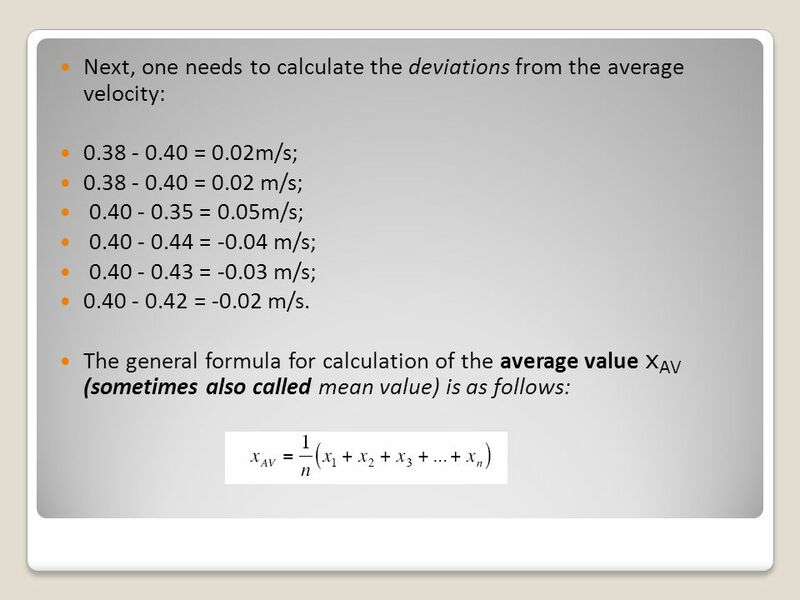 The subscript usually indicates the quantity that the standard deviation is calculated for, e.g., sv stands for the standard deviation of velocity measurements, whereas sa is the standard deviation for acceleration data. 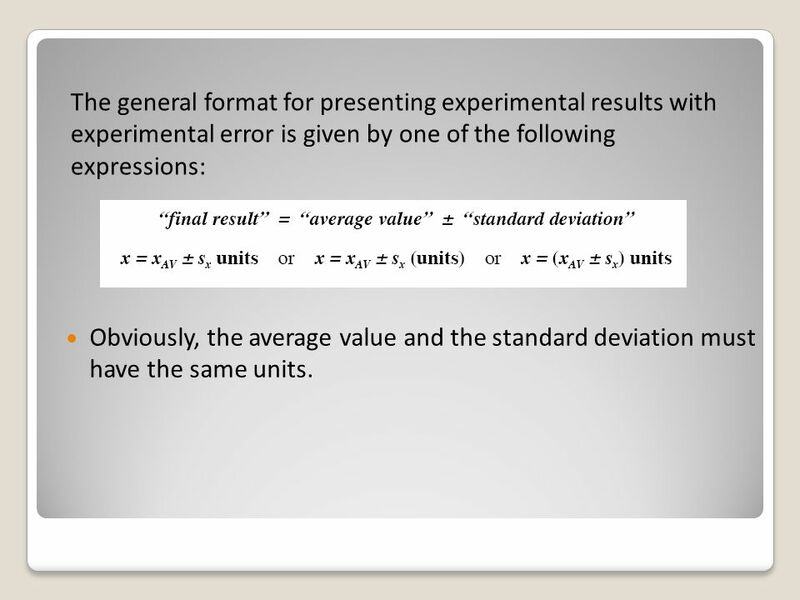 15 The general format for presenting experimental results with experimental error is given by one of the following expressions: Obviously, the average value and the standard deviation must have the same units. 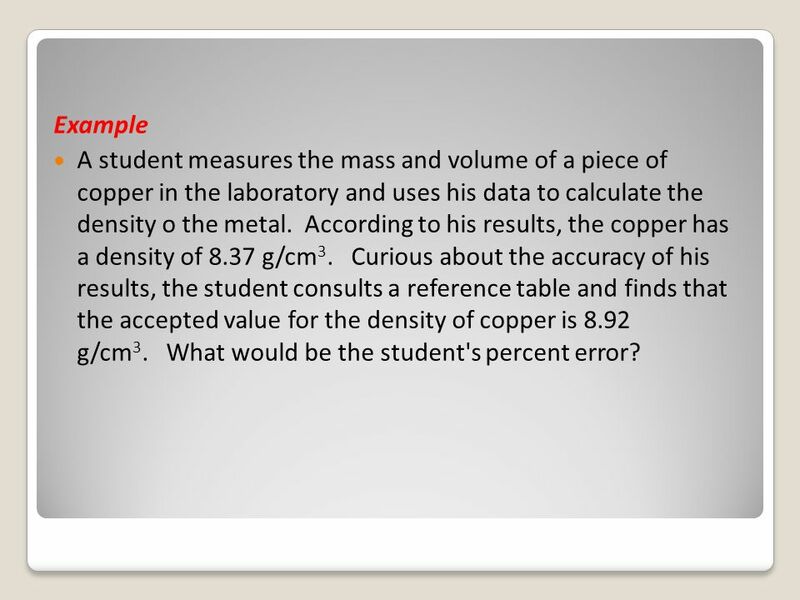 16 Example A student measures the mass and volume of a piece of copper in the laboratory and uses his data to calculate the density o the metal. According to his results, the copper has a density of 8.37 g/cm3. 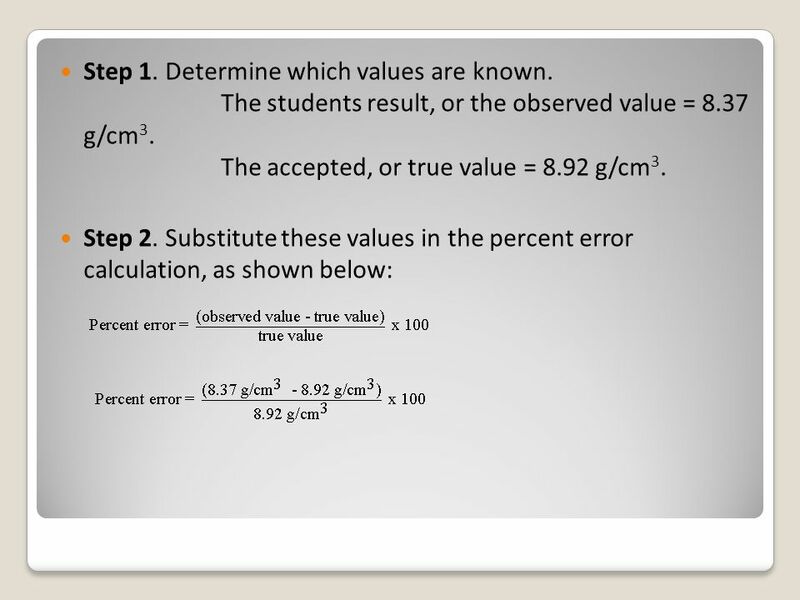 Curious about the accuracy of his results, the student consults a reference table and finds that the accepted value for the density of copper is g/cm3. What would be the student's percent error? 18 Step 3. Solve for the unknown, and round to correct significant digits. Percent Error = -6.17% Please note that the negative sign does not mean that the error was less than zero, which would be impossible. It shows that the student's calculated value was actually too low. 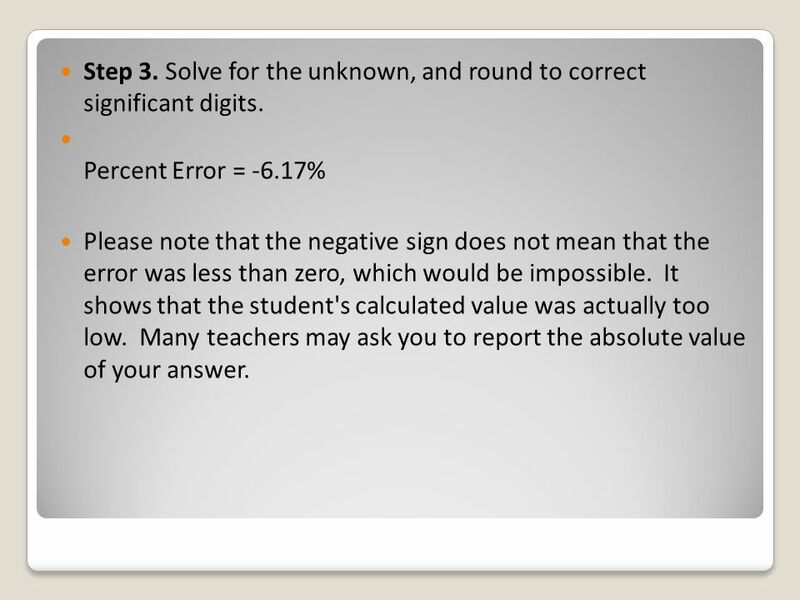 Many teachers may ask you to report the absolute value of your answer. 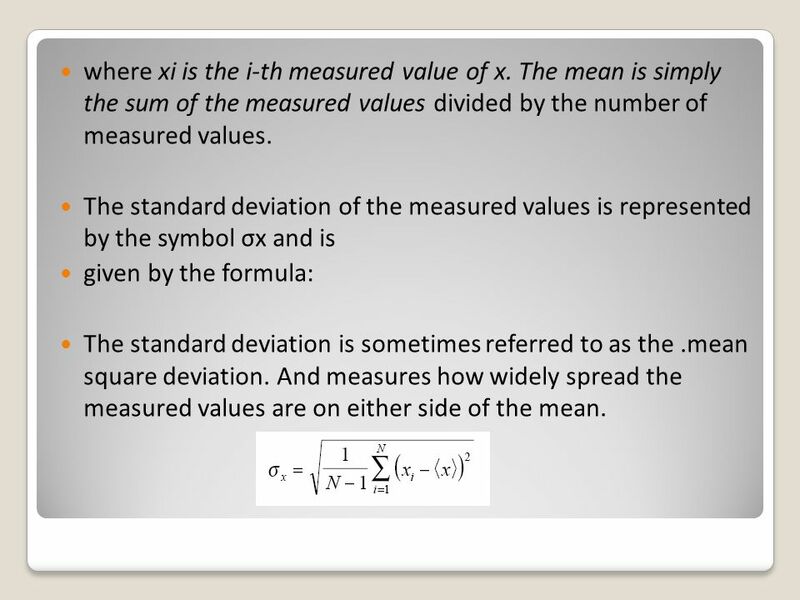 where xi is the i-th measured value of x. The mean is simply the sum of the measured values divided by the number of measured values. 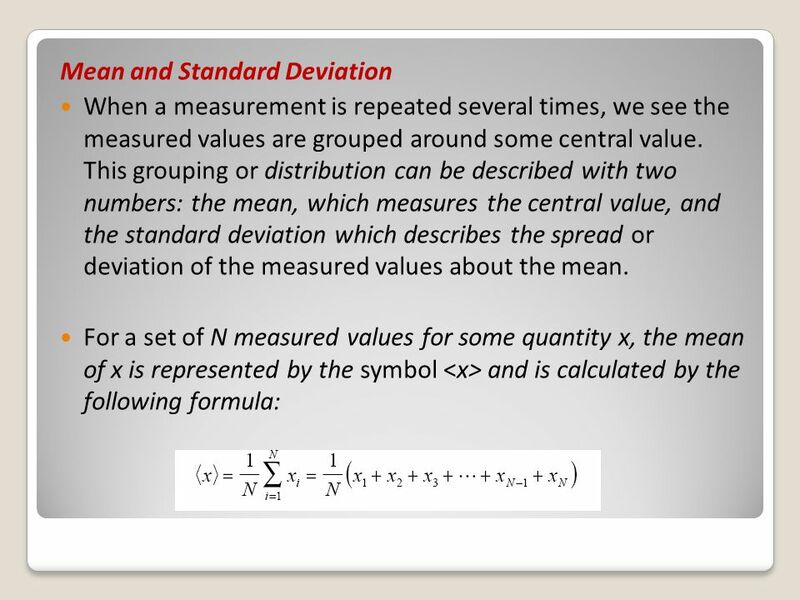 The standard deviation of the measured values is represented by the symbol σx and is given by the formula: The standard deviation is sometimes referred to as the .mean square deviation. And measures how widely spread the measured values are on either side of the mean. 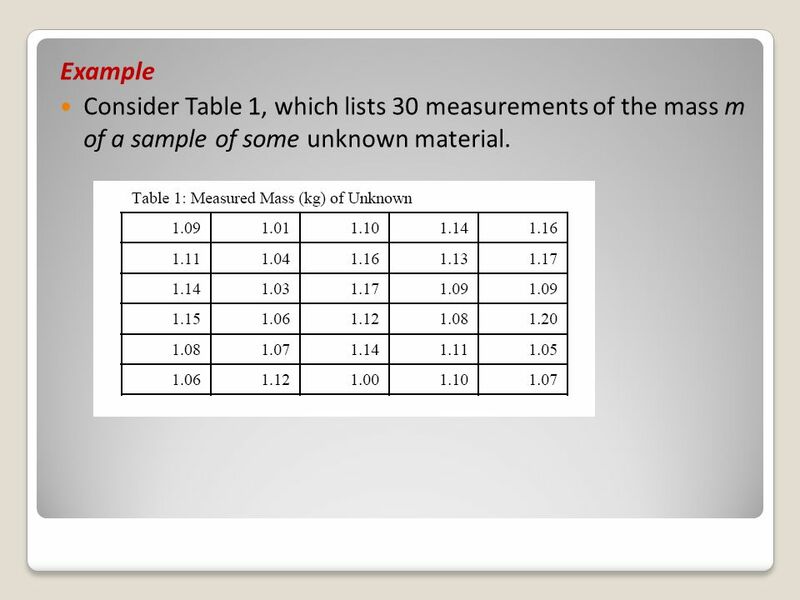 23 Example Consider Table 1, which lists 30 measurements of the mass m of a sample of some unknown material. 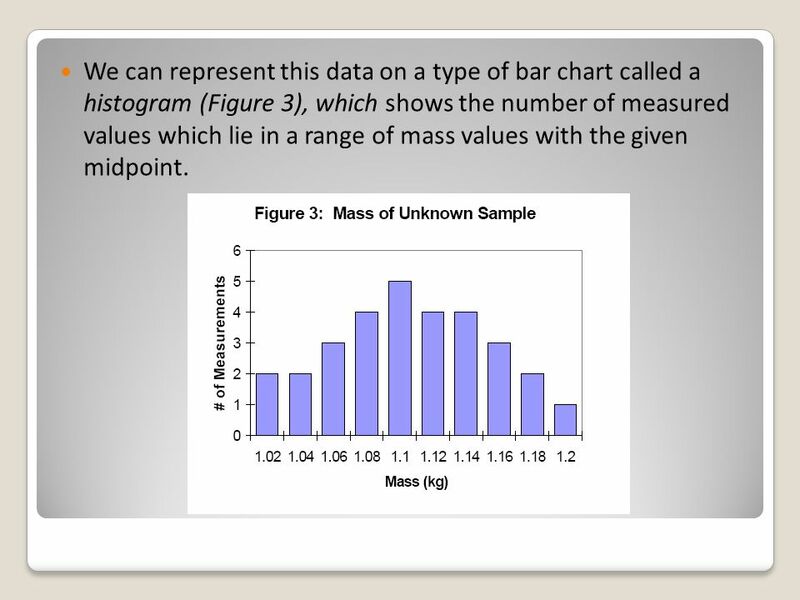 24 We can represent this data on a type of bar chart called a histogram (Figure 3), which shows the number of measured values which lie in a range of mass values with the given midpoint. 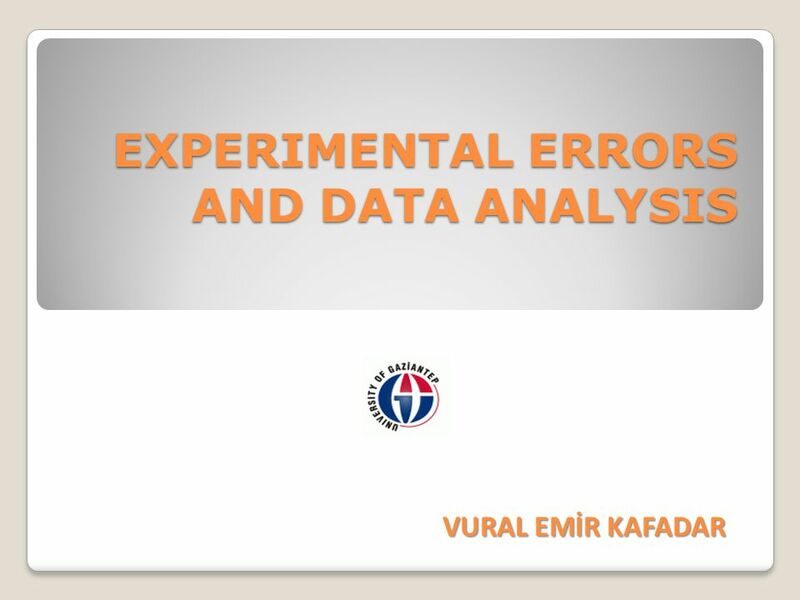 Download ppt "EXPERIMENTAL ERRORS AND DATA ANALYSIS"
Uncertainty & Errors in Measurement. Waterfall by M.C. Escher. 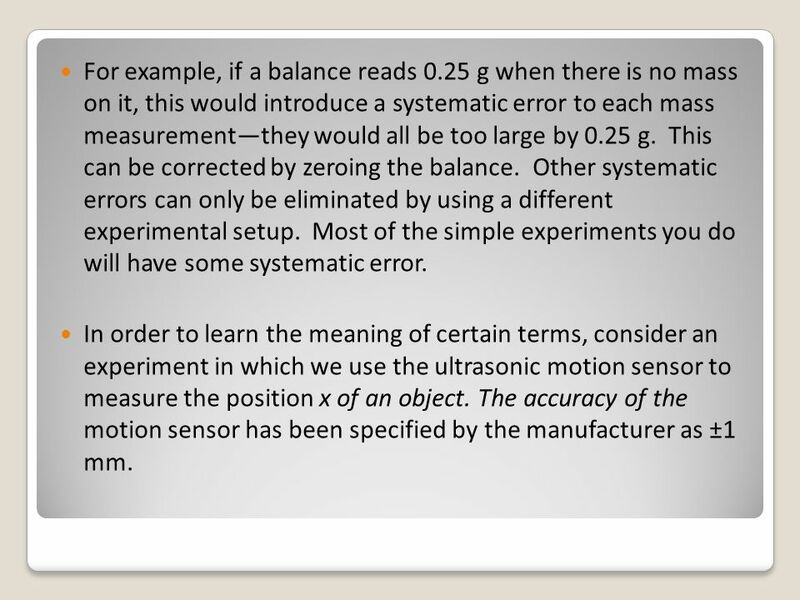 1 Chapter 2: Measurement Errors  Gross Errors or Human Errors –Resulting from carelessness, e.g. misreading, incorrectly recording. 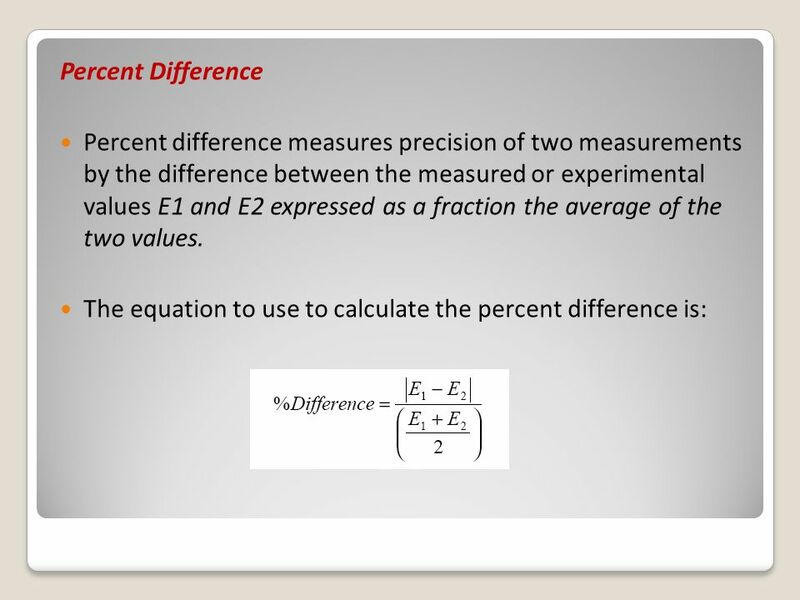 1 Seventh Lecture Error Analysis Instrumentation and Product Testing. Laboratory Measurements Measurements consist of –Number: Tells amount measured –Units: Kind of measurement made –Uncertainty: Possible error No Measurement.